The construction that is visible in the last photo is merely a gravel parking lot turning into a paved parking lot, to match the other paved lot on the north side of the street. There are some issues, still. 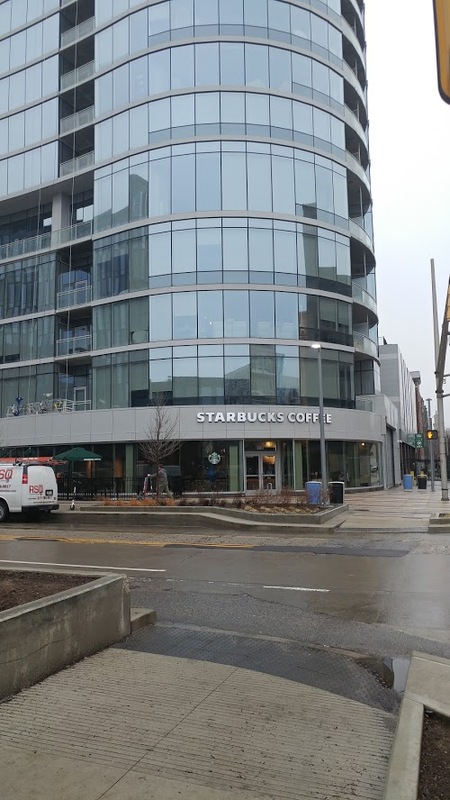 I really wish that the Whole Foods/Starbucks building could have been configured without the mid-block car entry on Market Street. The apartments on the east side of the street are…well…hmm. 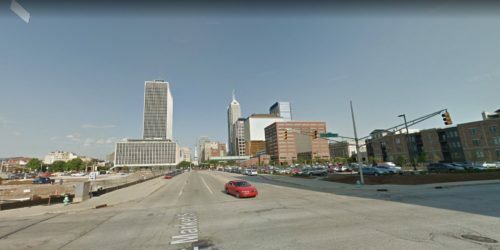 But, overall, the corner is interesting to me, because these streets are not as wide as standard downtown Indy streets. I wish we had a lot more intersections of this width. Cars go pretty slowly through here, even with the (silly) one-way street on New Jersey. There are no bike lanes, but bikes don’t feel out of place at all. The closest transit stop is one block over on Alabama Street, so not too far away. Basically, it’s fully built out for now, so whatever is here will likely be here for a while. I agree the intersection has improved tremendously over what has been there in the past. But there are improvements that still need to be made-most importantly pedestrian signals. Try crossing New Jersey St. on the north side of Market Street as a pedestrian; there are no pedestrian signals here making this crossing very dangerous for pedestrians. In addition, Market Street and the intersection are in terrible shape due to all of the recent construction. I believe the city has a project planned this summer to resurface the street and the intersection. I am not sure if that project will address the traffic signal issue. It’s true, and I did omit this detail from the blog post. I have been assured by DPW that the new crosswalk signals will be in place after the Market Street project. Looking forward to that, because as you say, it’s not good right now. 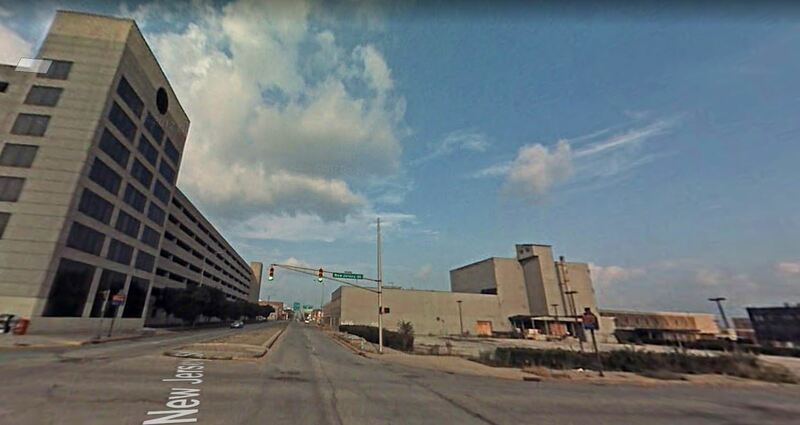 wish they’d make it brick so it wouldn’t be so high maintenance and it’d be uniform with market street east of this development to the circle… plus it encourages slower driving. No matter how many times I see those orange apartments tacked to the side of the parking garage, I catch myself wondering when they are going to put the exterior paneling over the sheathing. Man, I freaking love those apartments (or at least the idea of them) tagged on the side of the parking garage. I’d love to see more of that elsewhere. 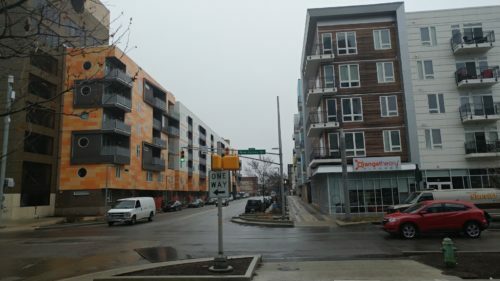 Skinny down a street by moving the sidewalk toward the other sidewalk and use the resulting space for apartments or townhomes. i like the idea too, the execution is ok, it’s at least something different and appears to have had some actual design to it. I like the circular windows that have views straight downtown to the monument. It’s basically 1/4 of a texas donut, wish all the garages were covered like this but most are too close to the street. They should really put a building in that big empty grass lot next to the goverment parking garage/government building/big blue hotel at west st/washington. 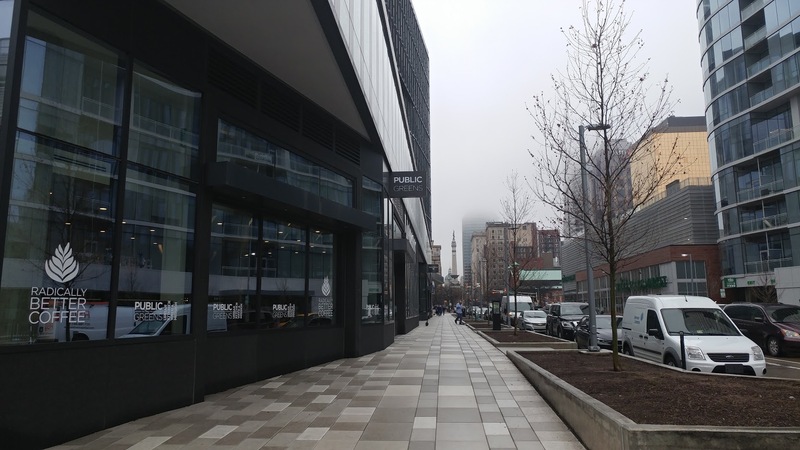 I’m not a fan of the parking garage facing the rest of downtown or the cummins garage being super generic and front and center but I love the cummins building and i’m mostly happy with the market360 tower, artistry is…. what it is but I agree, most of this is pretty good, that street between cummins and market360 should really be turned into brick, it’d be a nice continuance of the brick on the other side of the street plus the existing concrete as absolute doodoo. I was thinking about the transformation of this intersection while sitting at a table at the Starbucks next to the window and facing east. It occurred to me that if someone were dropped into that spot from just a few years earlier, the only clue as to location would be 1) the City County Building way over my right shoulder; or 2) the entrance to the Market District Garage if someone had a real eye for detail and could recognize it even with the apartments appended. 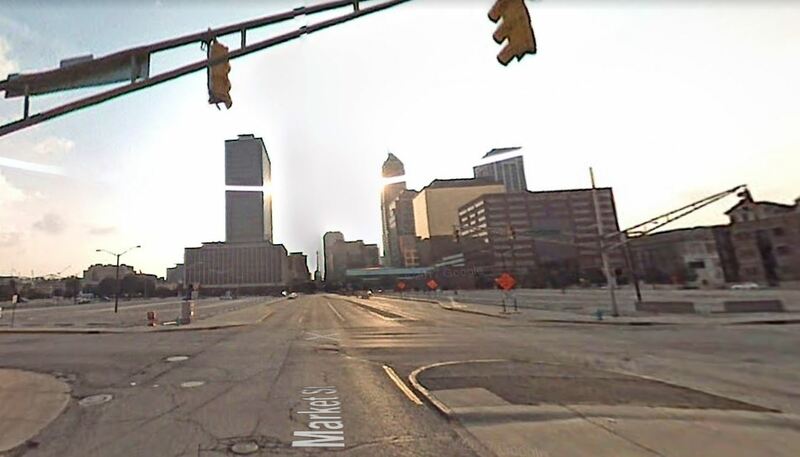 It’s a pretty notable transformation that isn’t often seen in Indianapolis. Actually, such transformations are gaining momentum throughout downtown (which I do not restrict to the Mile Square). Perhaps the most transformative locale is CityWay as phase II builds up and out. Drive south on Pennsylvania past the new Hyatt and then left on East Street. Delaware Street between the railroad overpass and East Street looks far different than just five years ago. The north side of East beyond the Alexander Hotel, and the west side of Virginia north to the overpass, are also very different now. Within several years the PanAm Plaza will look and feel very different as well, with the new Signia Hilton rising to 38 stories, and another hi-rise hotel and convention center expansion filling out the space. Last but not least, the developing Bottleworks at the east end of Mass Avenue and College round out the major transformations that will change the streetscapes, skyline, and vibrancy of our dowmtown. I look for the downtown population to conti ue its upward trajectory for the foreeable future.